The Commonwealth of Massachusetts was the 6th state to enter the union, ratifying the Constitution on Febuary 6th, 1788. Originaly it was the Plymouth Colony and the Massachusetts Bay Colony which later merged into a colony, herein called Massachusetts. 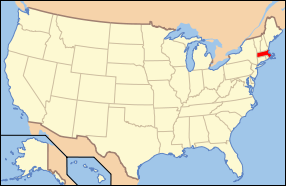 The State of Maine was seperated out from the northern disjoint region of the state. See Massachusetts and http://en.wikipedia.org/wiki/Massachusetts for more information.